From family Brachylaimidae, a trematoda species was obtained from the bile ducts of Acomys russatus (Rodentia: Muridae) from Saint Catherine mountain, South Sinai, Egypt. Sven out of nine (77.78%) of examined mice were infected. Scanning electron microscopy is used to describe the adult stage morphologically and anatomically by light microscopy. A comparison is made with other brachylaimid species known to infect rodents. Specific characteristics such as lanceolate shape; shoulders unique cephalic cone; both suckers are conspicuously close to each other; an aspinous tegument; well-developed excretory system; uterus extends to the posterior margin of the ventral sucker only; vitelline follicles distribution. In addition, Acomys russatus bile ducts are an exceptional microhabitat. Transverse folds, cobblestones, three types of papillae and cytoplasmic ridges were detected by scanning electron microscope. No other known Brachylaima species exhibits all of these features. B. aegyptica n. sp. seems to be the second brachylaimid species of this genus found in Egyptian mammals since 1899 when Looss collected B. aequans from Gerbillus aegypticus. Trematodes, Bile ducts, Golden mice, Brachylaimia. Although most of trematodes have an aquatic habitat, some have colonized the terrestrial habitats . Brachylaimidae and Dicrocoeliidae have colonized in very arid, xerophilous habitats . Numerous species from Brachylaimidae have a worldwide distribution. Butcher  listed 72 valid species of genus Brachylaimia. Brachylaimids are pathogenic to humans [4,5], cause poultry infection , domestic animals  and wild game birds  so it has a medical value. Moreover, Galan-Puchades et al. reported that it plays a biological role in studing postfire ecosystem regeneration processes. Brachylaminae, Ityogniminae and Panopistinae are members of brachylaimid subfamilies . They are sharing in a similar three-host in their life cycles. Also, it represents mollusc individual terrestrial gastropod as a first and second intermediate host. Moreover, the endothermic vertebrate is considered as definitive host. Mammals such as insectivores, rodents, marsupials and birds represent the definitive hosts. The majority of haematophagous adult brachylaimids are intestinal in living . Very few of them could be found in other parts of the digestive tract or other organs. From oesophagus and stomach, Brachylaima oesophagei and B. fulvus [12,13], from liver and pancreas ducts Scaphiostomum species  and from nasal and frontal sinuses Dollfusinus frontalis were recorded [14,15]. It must be kept in mind that hepatic and pancreatic duct joined to the alimentary system via the common bile duct directly. There was a worldwide distribution of Brachylaimids; Europe, Africa, North and South America. Concerning to Egypt, the no study on mammals' brachylaima has been done so far since when Looss collected the adult of B. aequanus from Gerbillus aegyptiacus. Wanas et al. collected metacercariae of genus Brachylaima from kidney of land snail Monacha obstructa. From birds, Metwally  recorded B. fuscatus from Cloumba livia livia while Ammar and Abd El-Monem  recorded B. mazzantii from C. l. domestica. This paper aims to describe new Brachylaima trematode inhabiting bile ducts of liver of desert mouse (Acomys russatus) in Egypt. During June and July of 2013, 9 golden spiny mice, Acomys russatus (total body length 16-20 cm) were trapped by Bedouin from Saint Catherine mountain, South Sinai, Egypt, and transported alive in cage mice to El-Mansoura University (about 600 km). Trapping was carried usually during June and July where the temperature ranged from 35-4°C at night by live traps which were designed for rodents by using meat, snails, and insects as a bait. The golden spiny mouse, Acomys russatus is diurnal rock-dweller arid desert inhabitant and omnivorous animals. Although A. russatus is diurnal rodent, it can become largely nocturnal to avoid direct competition for resources with the closely-related common spiny mouse Acomys cahirinus . The holy Sinai Peninsula is characterized by the almost complete absence of superficial water bodies like rivers, lakes and only there are some few springs. Also the triangular Peninsula is interesting from the zoogeographical point of view because it is linking Africa with Asia. Despite this fact, current knowledge of the Peninsula fauna is still rather limited. Concerning the helminth parasites of this region of Egypt particular helminth parasites of small rodents are still to be studied because no survey has been performed. Mice was identified according to Tharwat  and anaesthetized with chloroform. Animals were dissected and organs were examined individually in 0.9% saline solution. The helminth parasites were dislodged using a fine needle under a stereomicroscope. In order to study the anatomy of the parasite, worms were washed several times in saline solution to get rid of any adherent debris to its body. They were fixed in alcohol-formaline-acetic acid (AFA) under a slight cover slip pressure and preserved in 70% ethyl alcohol. Whole mounts were stained in alum carmine, dehydrated in ethyl alcohol, cleared in terpineol and mounted in DPX. For scanning electron microscopy, the collected worms were washed thoroughly with 0.9% saline solution fixed overnight in 2.5% glutraldehyde buffered at pH 7.4 with 0.1M sodium cacodylate-HCl, containing 3% sucrose and 1% calcium chloride. The specimens were post-fixed in 1% osmium tetroxide in the same buffer and dehydrated through an ascending series of ethanol. This genus of recovered trematode was identified according to Yamaguti  and Gibson et al. . By using of a camera lucida, drawings were made and measurements proposed for Brachylaimidae by Mas-Coma, Montoliu and Valero . Out of 9 golden spiny mice examined, 7 were found to be naturally infected with one new brachylamid species, Brachylaima aegyptica, with an infection rate of 77.78%. The parasites were collected from the bile ducts of liver. The morphology, infection parameters and scanning electron microscope (SEM) observations are listed in details below. Morphological description of Brachylaima aegyptica n. sp. Anatomical features: Body is aspinous, lanceolate in shape, with a characteristic shouldered appearance due to its shorter cephalic cone. Some specimens are tongue to sole-shaped with rounded anterior extremity, more or less parallel sides and pointed at posterior extremity (Figures 3A and 4). Oral sucker is subterminal, subglobular, well developed and slightly larger than ventral sucker. Ventral sucker is circular saucer-like (Figure 5) and situated in the first quarter of body length. Both suckers conspicuously close to each other and partly overlapping the pharynx. Pharynx was globular, strongly muscular originating on posterior margin of oral sucker (Figures 1A and 5). Intestine was recurring immediately after the intestinal bifurcation. Intestinal caeca, sinuous, enlarging, extending parallel to lateral margins and ending blindly near the posterior body end. Figure 1. 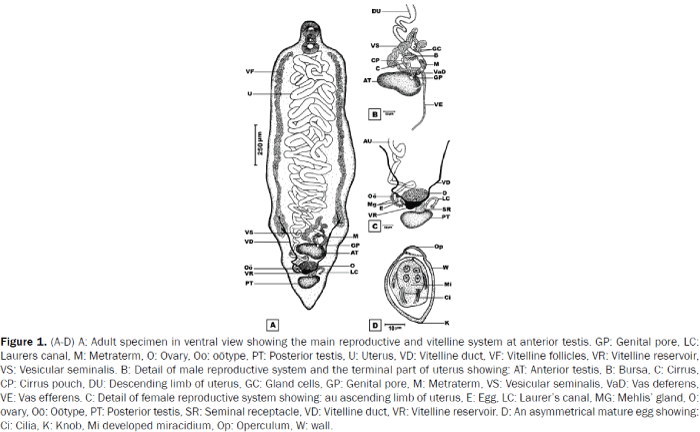 (A-D) A: Adult specimen in ventral view showing the main reproductive and vitelline system at anterior testis. GP: Genital pore, LC: Laurers canal, M: Metraterm, O: Ovary, Oo: oötype, PT: Posterior testis, U: Uterus, VD: Vitelline duct, VF: Vitelline follicles, VR: Vitelline reservoir, VS: Vesicular seminalis. B: Detail of male reproductive system and the terminal part of uterus showing: AT: Anterior testis, B: Bursa, : Cirrus, CP: Cirrus pouch, DU: Descending limb of uterus, GC: Gland cells, GP: Genital pore, M: Metraterm, VS: Vesicular seminalis, VaD: Vas deferens, VE: Vas efferens. C: Detail of female reproductive system showing: au ascending limb of uterus, E: Egg, LC: Laurer’s canal, MG: Mehlis’ gland, O: ovary, Oö: Oötype, PT: Posterior testis, SR: Seminal receptacle, VD: Vitelline duct, VR: Vitelline reservoir. D: An symmetrical mature egg showing: Ci: Cilia, K: Knob, Mi developed miracidium, Op: Operculum, W: wall. Figure 2. Adult specimen in ventral view showing the excretory system and alimentary tract. Note AB: Anterior branch, D: Ductulus, EP: Excretory pore, EV: Excretory vesicle, IC: Intestinal caecum, LCEC: Left ciliated excretory canal, LED: Left excretory duct, LEED: Left external excretory duct, LMEC: Left main excretory canal, RCEC: Right ciliated excretory canal, RED: Right excretory duct, RIED: Right internal excretory duct, RMEC: Right main excretory canal, PB: Posterior branch, PT: Posterior testis, TED: Transverse excretory duct. Both right external and left internal excretory ducts omitted. Gonads were tandem in shape and located at the posterior quarter of the body, intercaecal, transversely oval in shape with smooth margins and arranged more or less in longitudinal line (Figures 1A and 3A). Anterior testis slightly orientated upward to right side and larger than posterior one. Vas efferens is originated from anterior margin of posterior testis. It is running until join very short vas efferens anteriorly. Moreover, it becomes large in width at the anterior portion of testis to from vas deferens. It is connected anteriorly with prolonged coiled vesicular seminalis that filled with sperms. Vesicular seminalis links to an obvious bursa, ringed with multiple gland-cells that open within. Bursa then narrows, convoluted to form unarmed cirrus which opens into claviform thick walled cirrus pouch. Common genital pore is originated from joining of cirrus pouch with distal end of female metraterm. It opens ventrally in the posterior quarter of body at the level of anterior margin of anterior testis (Figure 1B). Figure 3. (A-B) photomicrographs stained with alum carmine. A: Whole body of fluke in dorsal view with lanceolate shape. Note both suckers are closely to each other and uterus, located behind the ventral sucker, G: Gonads, IC: Intestinal caecum, M: Metraterm, RCEC: Right ciliated excretory canal, RMEC right main excretory canal, S: Shoulder, TED: Transverse excretory duct, U: Uterus, VR: Vitelline reservoir. B: Asymmetrically egg obtained from uterus showing: K: Knob, Mi miracidium, Op: operculum. Ovary oval, smooth localized sinistrally to oötype and opens within by oviduct. Oötype surrounded by Mehlis’glands and connects with uterus by ascending limb of uterus (Figure 1C). Extracaecal vitelline follicles irregular in shape, moderate in number and size, parallel to caeca and extending from the posterior level of the ventral sucker to level of the vesicula seminalis. Vitelline collecting ducts are arising from vitelline follicles on each side, running posteriorly to join forming a vitelline reservoir. Vitelline reservoir is somewhat right triangle in shape, located medially, between the ovary and the posterior testis and measures 39.6 (38.2-41) x 72(69-75) (Figures 1A, 1C and 3A). Laurer’s canal arises dorsally from sub-spherical seminal receptacle finally opening into dorsal surface of the worm and just anterior the anterior margin of the posterior testis. Seminal receptacle, located between the posterior testis and vitelline reservoir and opens into ovary. Uterus emerging from ootype passing dorsal to ovary turns anteriorly to form loop. Ascending limb of uterus runs anteriorly in a position dextral to the anterior testis in a single file, then uterus lumen winds, is filled with (Figure 13 and Figure 14) and connects to tight intercaecal folds. Anteriorly, uterine folds proceed to the posterior edge of ventral sucker and unoverlapping it. Posteriorly, uterus wriggles until the beginning of anterior testis. End of descending limb lumen more or less attenuates, walls become thicker and muscular to form a wall differentiated metraterm opening at genital pore (Figure 1A). Figure 13. Transverse section of the worm through the uterus showing eggs. Figure 14. 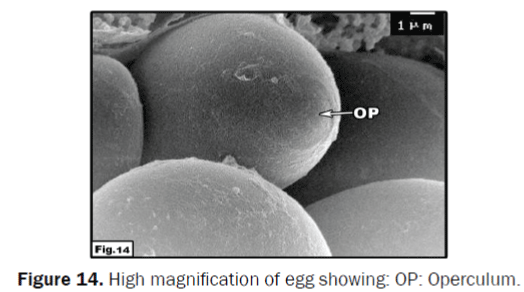 High magnification of egg showing: OP: Operculum. The excretory system is of “stenostoma” type. Y-shaped excretory vesicle located at the posterior extremities of the intestinal caeca and opens by sub-terminal excretory pore. Two main excretory canals are extended until the level of pharynx, and then loop around themselves posteriorly, forming two canals near to excretory vesicle. Lumen of each canal has narrow spiral strips of cilia and is divided at posterior end into two ducts. Internal duct is divided into two branches anteriorly at the level of posterior testis; beside the anterior margin. First branch is extended until body end posteriorly in the area of complicated network of capillaries and protonephidia. While, second branch is extended only to ventral sucker region anteriorly and connected with capillary ductules along the way. External duct starts from end of each ciliated canal posteriorly, extended laterally until caecum and connects to ductules of oral sucker region. Number of protonephridia is three in groups. The most remarkable interesting feature in this system is the presence of four pairs of ducts extending transversely from ciliated canals to the main excretory canals at the first quarter of the body. Eggs and miracidum: Embryonated eggs (in the terminal uterus of adult worms) are typically asymmetrically ovoid (one side slightly flattened), 28.8 x 19.8 (26.2-31.4 x 18.8-20.8) μm in size, yellowish, thin walled, small operculum present at one end and a small abopercular knob at the opposite end. A well-developed miracdium with ciliate nature is evident within the mature egg (Figures 1D and 3B). Scanning electron microscope (SEM) studies have revealed that the present of a sole-shaped body digenean parasite (Figure 4) with an oral sucker, ventral sucker, genital opening and excretory pore. The worm organs were located at the midventral line of the worm body. The fluke was characterized by the presence of shoulders and cephalic cone (Figure 5) and covered with aspinose corrugated tegument forming several folds and furrows on its ventral aspect. With the exception of the sucker rims and terminal extremities, the folds seem to be transversely. These folds are generally composed of fairly regular outgrowths resembling cobblestones (Figure 6). A number of randomly scattered large sized rosette papillae are distributed over the whole body surface (Figure 7). Figure 4. Whole worm of B. aegyptica n. sp. in a ventral view showing: Sole-shaped body, OS: Oral sucker, VS: Ventral sucker, GP: Genital pore and EP: Excretory pore. Figure 5. Anterior region showing: CC: Cephalic cone, CR: Cytoplasmic ridge, Ph: Pharynx and S: Shoulder. Figure 6. Details of tegument showing: CO: Cobblestones, CR: Cytoplasmic ridges and RP; Rosette papillae. Figure 7. High magnification of rosette papillae and cobblestones. The subterminal oral sucker possesses circular mouth opening and rosette papillae. These papillae distributed around the oral sucker rim in regular pattern and concentrated in the dorsolateral surface (Figure 8). Moreover, some pores were observed. The innermost margin of oral sucker was also provided with papillae, while the internal surface of the sucker was covered with wrinkled fleshy mass possesses a microvilli- like projections that directed inward (Figure 8). Figure 8. Details of dorsolateral surface of oral sucker showing: MP: Microvilli–like projection, RP: Concentrated rosette papillae. Ventral sucker was located just posterior to cephalic cone fairly as a saucer. Regarding the morphology of ventral sucker papillae, there are three varieties of tegumental papillae. The outermost type I (rosette papillae) is located on the surface and bilaterally symmetrical. Type II (dome papillae) is few in number and small in size. Type III (button papillae) papillae are appeared to be sink into the wrinkled tegument. The papillae apex is enveloped with the lower cytoplasmic ridges. The ventral sucker internal surface is similar to oral one (Figure 9). Figure 9. Distribution of papillae on the ventral sucker surface; Type I=Stars rosette papillae; Type II=Arrow head dome papillae; Type III=Button dome papillae (arrows) and CR: Cytoplasmic ridge. 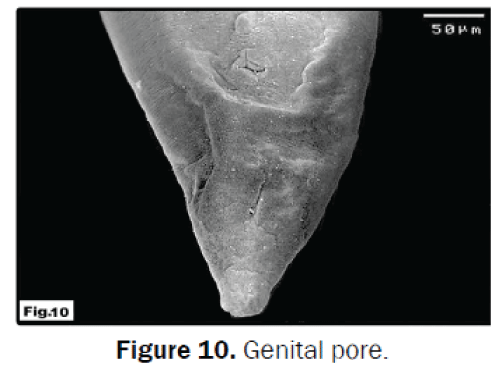 Genital pore was seen at the beginning of the forth quarter with rectangular appearance (Figure 10). The tegument was curved around it and arranged in the form of parallel folds which showed few dispersed rosette papillae (Figure 11). The excretory pore is located ventrally at the posterior extremity of the body and was found to be characterized by a stellate- shaped opening (Figure 12). The tegumental folds were concentrically arranged around it and possess a little rosette papillae. Concerning the Laurer's canal opening may be obscured due to an underlying fold of body wall over it. Figure 11. High magnification of genital pore showing: EE: Extruding egg, F: Curved and parallel folds, and RP: Rosette papillae. Figure 12. Stellate-shaped excretory pore, RP: Rosette papillae. Type species: Brachylaima aegyptica n. sp.. Type locality: Saint Catherine, mountain, south Sinai, Egypt. Type specimens: Slids with holotype were deposited at the Zoology Department Museum, Faculty of Science, Mansoura University. Prevalence: 7/9 mice examined (77.78%). Etymology: The species is named in reference to Egypt where the parasite was discovered and described for the first time. Anteriorly, just to the anterior margin of the anterior testis, the genital pore is founded. This feature allows this worm to be included in the subfamily Brachylaiminae. In this subfamily, only two accepted genera: Scaphiastomum Braun  and Brachylaima Dujardin . Genus Brachylaima includes various species that supplement their life cycles in mammals and birds [23,24]. Table 1. A comparison between Brachylaima aegyptica n. sp. (present study) and those closely related species of the same genus. Measurments (in micrometres). Volumes are means ± SD, with ranges in parentheses. Microhabitat: Adults members of brachylaimids are parasitizing intestine except B. microti . In the present study, Brachylaima adult worms are (extra-intestinal), parasitizing liver bile ducts. Shape of the body: lanceolate with cephalic cone, shoulders and pointed end that not agrees with the general pattern of other brachylaimids. Suckers: In this study, both suckers are relatively small while in other Brachylaima are relatively large with compare to the body size. Situation of the ventral sucker: the most important feature recorded in Egyptain parasite is that the conspicuously close to the oral sucker by overlapping the pharynx. In other brachylaimids it equatorial or pre-equatorial, always at some distance away from the intestinal bifurcation. Gonads: generally in longitudinal line, with less frequently anterior testis slightly displaced. In most brachylaimids gonads was forming triangle together. Vitellarium: extending more or less from forebody to midbody in present parasite; never reaching the forebody in Brachylaima. Uterus: its anterior extremity never reaching the anterior margin of the ventral sucker in present parasite; usually even clearly overlapping its anterior margin to a distinct space, in numerous species. Geographical distribution: the establishing of new Brachylaima species should be supported not by a detailed description but also by unique distribution. In comparison the four Brachylaima species parasitizing rodents (Table 1), all of them described from Spain, with only species described from Egypt, an integration of characters like body shape, ventral sucker situation, and clear extended uterus make the Egyptian Brachylaima different. Furthermore, Mas-Coma et al. reported that if the digeneans live different mollusc species in different geographical areas it will be accepted to consider a different species. Excretory system: as the brachylaimid type in basic structure, this seems clearly restricted to the longitudinal canals. Nevertheless, no information was given by authors about the lateral ciliated canal of B. oesophagei . The most remarkable structure in excretory system and may be recorded for the first time is the presence of four pairs of ducts extending transversely from ciliated canal to the main excretory canal at the first quarter of the body. All points discussed above permit us to classify the Egyptian trematode as a new species. The name Brachylaima aegytica n. sp. is proposed. Numerous sensory papillae are sparse all over the body surface of B. aegyptica n. sp. These papillae are founded at fine nerve processes ending and they extend from the peripheral nervous system to the base of the body surface layer . In the present study, (SEM) has shown that there are many sensory papillae concentrated on the anterior region of the oral sucker. The functions of oral sucker papillae remain speculative for all helminthes. Ashour  and Garo et al. suggested that the papillae on the oral sucker of the digenean Corrigia vitta and Sandonia sudanensis, respectively serve to select the appropriate site of attachment in the host tissue. However, Buchmann and Lindenstrom  mentioned that these papillae serve to detect the host mechanisms responsible for acceptance or rejection of the parasites. Moreover, the sensory papillae have been reported on the tegumental surface of the oral sucker in Haplorchoides cahirinus by Hamada and Abdrabouh  they suggested that these papillae may serve as chemoreceptors, tangoreceptors and mechanoreceptors, which enable the oral sucker to achieve a firm attachment during feeding. .The sensory papillae were observed in the present study on/or around the ventral sucker, were close to the receptors found in Deropristis inflate by Filippi et al. . They recorded two types of sensory receptor which may function as tango-, rheo-, or chemoreceptor. Â½dárská  made a transmission electron microscope study on the ventral sucker papillae of B. aequans. His study revealed that the presence of three types of papillae and the presence of nerve fiber running from the papillae to the nerve trunk. According to these results he proposed that these papillae are functioning as sense organs to the fluke. The distribution pattern of papillae on the trematode surface was found to be different among different families. For example, it may have a regular pattern of distribution arranged in circles; lines; or in symmetrical groups such as those reported in Phyllodistomum umblae  and Echinostoma cinetorchis . However, in some other cases, the papillae distribution is random such as in Gorgoderina attenuate , and Leucochloridium sp. . In the present study, most of the papillae observed on the tegument were concentrated in the suckers region (anterior third), while small number of these papillae was distributed in random pattern. Filippi et al. mentioned that, the distribution of the sensory receptors is related to the worm attitude. The parasite tends to attach to the host via the ventral sucker and explores the near environment with the oral one. In the present work, SEM studies have shown also tegmental transverse folds, cytoplasmic ridges, cobblestones, which could share in nutrition by magnifying the free surface area . Nadakavukaren and Nollen  assumed that the folds on the tegument are caused by contraction waves of the internal musculature of the fluke. Otubanjo  agreed with Nadakavukaren that the formation of large body folds increase the surface area of trematode. SEM observation of other digeneans such as Bucephalus anguillae , Lecithochirum musculus , and Deropristis inflata  indicated presence of cytoplasmic ridges. In the present study, cytoplasmic ridges were recorded all over the body surface and surrounding type III papillae. Bakke  mentioned that, these ridges with sensory receptors may be related to muscular movement and have a function in contact communications. Cobblestones of the tegument have also been described for other digeneans such as B. anguillae , L. musculus , Deropristis inflata . Nadakavukaren and Nollen  suggested that the cobblestones may serve to increase the surface area for absorptive functions of tegument much like the microtriches of cestodes. Cobblestones amplifying the surface area of the body would be beneficial in large, vigorous worms . We are greatly indebted to Prof. Dr. Mohamed Fathy A. Mansour for his help in preparing the drawings. Yamaguti S. A Synopsis Review of life History of Digenetic Trematods of Vertebrates Keigaku Publishing company, Tokyo, 1975;590. Mas-Coma S andMontoliu I. The life cycle of Dollfusinusfrontalis, a brachylaimidtrematode of small mammals (Insectivora and Rodentia). Int. J. Parasitol. 1987;17:1063-1079. Butcher AR. Brachylaimacribbi (Digenea: Brachylaimidae): taxonomy, life-cycle kinetics and infections in animals and humans. PhD Thesis, Adelaide Univ, South Australia 2003;205. Butcher AR et al. Locally acquired Brachylaima sp. (Digenea: Brachylaimidae) intestinal fluke infection in two South Australian infants. Med. J. Austr. 1996;164:475-478. Butcher AR and Grove DI. Description of the life-cycle stage of Brachylaimacribbi n. sp. (Digenea: Brachylaimidae) derived from eggs recovered from human faeces in Australia. Syst. Parasitol. 2001;49: 211-221.
deFaria Duarte MJ. O cicloevolutivo de PostharmostomumgallinumWitenberg, 1923, no Estado do Rio de Janeiro, Brasil (Trematoda, Brachylaemidae). Rev. Brasil Biol. 1980;40:793-809. Balozet L. BrachylaemussuisMihi, 1936, trématode de l’intestin du pore. Rôlepathogéneet cycle évolutif. Arch. Inst. Pasteur Tunis. 1937;26:36-67. Gvozdev EV. New trematodes of gallinaceous birds of Kazakhsthan. Trudy InstZoolAkadNaukKazakhsthan SSSR 1953;1:175-181. Galan-Puchades MT et al. A proposed methodology for the use of helminth parasites as biological tags in the study of postfire ecosystem regeneration processes. Vie Milieu 1999;49:45-50. Mas-Coma S andGallego J. AlgunasconsideracionessistemáticassobrelasfamiliasBrachylaemidaeJoyeux y Foley, 1930 y LeucochloridiomorphidaeTravassos y Kohn, 1966 (Trematoda: Brachylaemoidea). Rev. Ibér. Parasitol. 1975;35:339-354. Mas-Coma S and Montoliu I. The life cycle of Brachylamaruminae n. sp. (Trematoda: Brachylaimidae), a parasite of rodents. Parasitol Res. 1986;72:739-753. Lewis JW.Studies on the life history of BrachylaimusoesophageiShaldybin, 1953 (Digenea: Brachylaimidae). J. Helminthol. 1969;43:79-98. Jourdane J. Helminthes parasites des micromarmmniféres des PyréneesOrientales. II. Les Plathelminthes de Soricinae. Ann. Parasitol. Hum. Comp. 1971;46:553-573. Mas-Coma S and Kahmann H. ZurBionomie von DollfusinusfrontalisBioccaetFerretti, 1958 (Trematoda, Brachylaemidae), Schmarotzerim Sinus frontalis und Cavumnasi von kleinenSäugetieren (Insectivora, Rodentia). ActaParasitol. Polon 1978;25:135-147. Mas-Coma Set al. 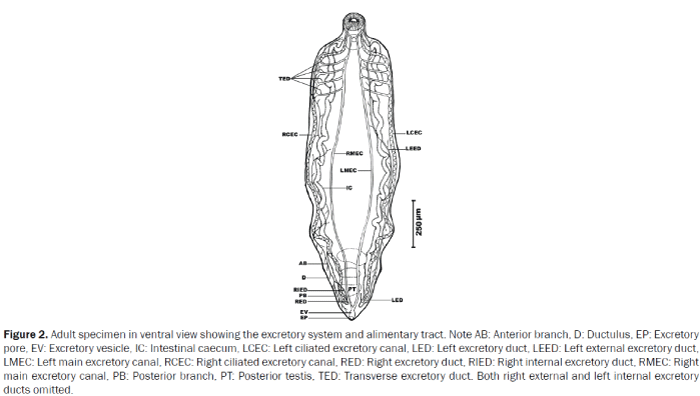 The genus Scaphiostomum Braun, 1901 (Trematoda: Brachylaimidae): a systematic review and description of Scaphiostomumpalaearcticum n. sp. Syst. Parasitol. 1987;8:141-150. Wanas MQet al. Morphological and anatomical studies on larval trematode of genus Brachylaima (Brachylaimidae) from the land snail, Monachaobstructa. J. Egypt Soc. Parasitol. 1995;25:407-415. Metwally DMA. Morphological studies on parasites of pigeons. MVSC Thesis, Fac. Vet. Med. Zagazig Univ. 2003. Ammar KNA and Abdel-Nonem S. Light and scanning electron microscopic studies on some trematodes infecting the domestic pigeons in Qena, Upper Egypt. J. Union Arab Biol. 2004;22:151-166. Tharwat ME. Mammals known to occur in Egypt. EEAA DeptNatuProtc Pub Natl Bio Unit 8. 1997. Yamaguti S. Systemahelminthumvol 1: The digenetic Trematodes of vertebrates 1, II Interscience Publishers Inc., New York,USA, 1958;1575. Gibson DI et al. Keys to the trematoda. 1: CABI Wallingford UK, 2002;521. Mas-Coma S, Montoliu I, Valero MA. Méthodologied’étudemorphométrique de la variabilitéintraspécifique chez les Digénes de la familleBrachylaimidaeJoyeuxet Foley, 1930. Bull. Soc. Neuchâtel Sci. Nat. 1984;107:185-195. Ubelaker JE and Dailey MD. Taxonomy of the genus Brachylaimadujardin (Trematoda: Digenea) with description of B. chiapensis sp. n. from Peromyscusguatemalensis in Mexico. J. Parasitol. 1966;52:1062-1065. Yamaguti S. Synopsis of the Digenetic Trematode of vertebrates Keigaku Publishing Company, Tokyo. 1971;2:349. Kruidenier FJ andGallicchio V. The Orthography of the Brachylaimidae (Joyeux and Foley, 1930); Brachylaimemicroti sp. nov.; B. rauschiMclntosh, 1950; and an addendum of Dollfus’ (1935) list of Brachylaime (Trematoda: Digenea). T. Am. Microsc. Soc. 1959;78:428-441. Halton DW. Microscopy and the helminth parasite. Micron 2004;35:361-390. Ashour AA. Scanning electron microscope observation on Corrigiavitta (Dujardin, 1984) Shtron, 1940 (Trematoda: Dicrocoelidae). J Egypt SocParasitol1995;25:25-30. Garo K, Bashter A, Sameh I. Scanning electron microscopical study on some parasitic helminthes from freshwater fishes in Helwan, Southern Cairo. J. Egypt Ger. Soc. Zool. 2002;33:133-145. Buchmann K andLindenstrom T. Interactions between monogenean parasites and their fish hosts. Int. J. parasitol. 2002;32:309-319. Hamada SF andAbdrabouh AE. Anatomical and morphological studies on the intestinal digenean parasite Haplorchoidescahirinus from Bagrusbajad in Egypt. J. Zool. 2005;44:81-97. Filippi JJ et al. Topography and ultrastructure of the tegument of DeropristisinflataMolin, 1859 (Digenea: Deropristidae), a parasite of the European eel Anguilla anguilla (Osteichthyes: Anguillidae). Parasitol. Res. 2013;112:517-528. Zdarska Z. Transmission electron microscopy of ventral sucker papillae of Brachyaimusaequans (Digenea: Brachylaimidae). Folia Parasitol. 1993;40:203-207. Bakke TA and Bailey RE. Phyllodistomumumblae (Fabricius) (Digenea, Gorgoderidae) from British-Columbia salmonids- a description based on light and scanning electron microscopy. Can. J. Zool. 1987;65:1703-1712. Lee SH et al. Tegument ultrastructure of juvenile and adult Echinostomacinetorchis. Korean J. Parasit. 1992;30:65-74. Nadakavukaren MJ andNollen PM. A scanning electron microscopic investigation of outer surfaces of Gorgoderinaattenuata. Int. J. Parasitol. 1975;5:591-595. Bakke TA. Functional morphology and surface topography of Leucochloridium sp. (Digenea), revealed by scanning electron microscopy. Parasitol. Res. 1976;51:115-128. Paperna I andDzikowski R et al. Digenea (Phylum Platyhelminthes). In: Woo PTK (ed) Fish dieases and disorders, Protozoan and metazoan infections, 2nd edn. ©CAB International, Wallingford, 2006;345-390. Otubanjo OA. Scanning electron microscopic studies of the body surface and external genitalia of a dicrocoeliidtrematode,ConcinnumepomopisSandground. Parasitol. Res. 1985;71: 495-504. Filippi JJ et al. Topography and ultrastructure of the tegument of Bucephalusanguillae (Digenea: Buccephalidae), a parasite of the European eel Anguilla anguilla (Osteichthyen:Anguillidae). J. Parasitol. 2010;96:1102-1111. Filippi JJ et al. Topography and ultrastructure of the tegument of Lecithochiriummusculus (Digenea: Hemiuridae), a parasite of the European eel Anguilla anguilla (Osteichthyes: Anguillidae). J. Morphol. 2012;273:361-370. Dias MLGG et al. Scanning electron microscopy of Ithyoclinostomumdimorphum (Trematoda: Clinostomidae), a parasite of Ardeacocoi (Aves: Ardeidae). Parasitol. Res. 2003;90:355-358. Gracenea M and González-Moreno O. Life cycle of Brachylaimamascomai n. sp. (Trematoda: Brachylaimidae), a parasite of rats in the Llobregat Delta (Spain). J. Parasitol. 2002:88:124-133. González-Moreno O andGracenea M. Life cycle and description of a new species of brachylaimid (Trematoda: Digenea) in Spain. J. Parasitol. 2006:92:1305-1312. Segad P et al. Brachylaimaaspersae n. sp. (Digenea: Brachylaimidae) infecting farmed snails in NW Spain: Morphology, life cycle, pathology, and implications for heliciculture. Vet. Parasitol. 2011:175:273-286.